ArchiCAD remains one of the top CAD software suites available to architecture, engineering and construction professionals. Find out how to run this software effectively without any slowdowns! ArchiCAD is a powerful 3D computer-aided design modeling software created by and for AEC professionals. ArchiCAD was the first CAD application capable of creating both 2D and 3D geometry and continues to be revolutionary for architectural design and modeling; yet in order for it to operate effectively and provide a quality user experience, a specific, high performance hardware configuration is required. 3D modeling processes consume significant hardware resources. As ArchiCAD evolves with background processes utilizing multiple cores, CPU performance is becoming increasingly essential. Background processes in ArchiCAD leverage multiple cores intensively, making the CPU capacity more essential for running these operations. Background processing helps the performance, navigation and display of large, complex models, but if your computer hardware doesn't have the necessary computing power, your experience can be severely impacted. In addition, models must frequently be stored somewhere on the machine. This is why 8GB to 32GB of physical RAM is necessary in order to save models and run applications simultaneously. If your workstation lacks essential computing power, your software applications will run slowly—a frustrating experience when trying to produce a model under strict deadlines. 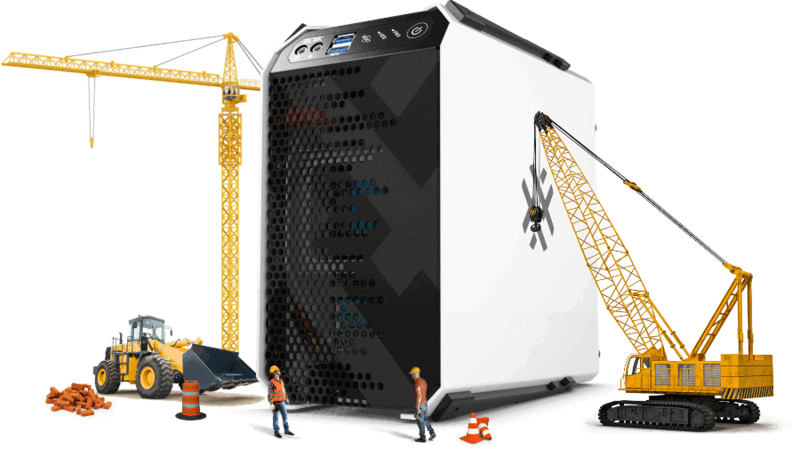 BOXX recommends an overclocked CPU to accelerate 3D modeling and design processes, so the APEXX S3, featuring a professionally overclocked eight-core CPU, effectively supports the multi-threaded background processing capabilities of ArchiCAD and frequency-bound design tasks. Designing stairs is one of the most complex tasks in architecture, particularly because they must comply with stringent standards. Now, thanks to new Stair and Railing Tools, you can extend your creativity on the fly with automatic validation against human ergonomics. The updated CineRender engine by MAXON provides integrated, photo-realistic rendering options in the BIM context. A flexible new Element Classification system supports any national or company-standard system and provides unprecedented interoperability among disciplines. IFC Model Referencing enables you to place IFC files as hotlinks into ARCHICAD projects as protected reference content. Model Filtering narrows the inserted IFC reference content by categories, such as Structural or MEP, or by element selection and the inserted IFC model content can be updated easily from the linked source file. Because you increasingly receive consultant information in a BIM format, Collision Detection will assist you as lead coordinator of the model. Rendering within ArchiCAD is an increasingly intensive process, so whenever possible, your rendering should be offloaded to a dedicated system. ArchiCAD integrates well with Cinema 4D to merge changes made in ArchiCAD into existing Cinema 4D visualizations. CPU will be an important factor in time spent rendering high-end visualizations and animations within these programs. Users can leverage single-socket APEXX X3 for CPU-intensive applications and rendering activities within ArchiCAD. The hardware features a powerful Intel® Core® X-Series processor with up to 18 cores and additional memory, making it a perfect enabler for producing intensive projects in less time. For AEC professionals, doing field work at a future site or outside the office is a normal occurrence, meaning that your resources need to travel with you. An ArchiCAD mobile workstation is capable of handling large data sets and performing complex modeling functions. GoBOXX SLM is an ultra-thin and light mobile workstation featuring a fast Intel® Core™ i7 CPU and professional NVIDIA Quadro graphics. Our GoBOXX MXL VR, a true desktop workstation replacement, houses NVIDIA GeForce graphics, along with a desktop-class Intel® Core™ i7, 64GB of RAM, and enough power and performance to support complex VR experiences on-the-go. Note: GeForce drivers are not certified for CAD. MXL VR is intended for delivering mobile virtual reality experiences. GoBOXX MXL with NVIDIA Quadro graphics is appropriate for CAD.